At last, after journeys long and arduous, I have returned to you, faithful blog. Sorry I was gone for so long. Life intruded. There is stuff I want to talk about! Lots of stuff. Well, a few things, really. Had to choose what to write about, and I decided it should be Magic: the Gathering. Like all the cool kids, I played this game back in the day. I believe I started when I was in junior high. I’m not talking about “Oh, yeah, I preferred the Guildpact expansion over Dissention.” I played the core game, people. There were no expansions. So, spending all my allowance on booster packs wasn’t that big of a deal. I had at least some chance of “catching them all,” if I may quote the Pokemon. No way I could do that now. I’m one of those people who couldn’t stand not having, if not all the cards, at least a good chunk of them. I kept playing through high school. Empty classrooms on lunch breaks were perfect for this. I remember losing a lot of matches. Actually, I don’t remember ever winning during that time. Truly a fact that boggles the mind of the game-obsessed me of the present. Much later in life, I got to play again with some of the same friends I played with back in high school. My cards were long gone by then, so I bought a premade deck (Going Rogue, specifically). Also borrowed decks from my friends, who still had their old collection. And hey, this time I started winning a few. I was especially proud to do it with my Going Rogue deck because it let me imagine a swarm of wicked faeries tearing my opponents apart. So, I guess I was just a crappy deckbuilder back in high school. Maybe I’d do better if I tried again today? I’ll never know. My friends and I stopped playing years ago, and I packed my deck away. When I was going through stuff recently, I found it, and it made me remember all this. I love Magic. I wish it wasn’t such a moneysink, or I might try to get back into it. But at least I have memories. And the old Microprose game, of course. 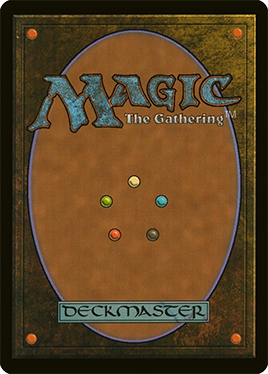 The cards may all be old, but I much prefer it to the new Duels of the Planeswalkers. For one thing, and I know it’s a minor detail, but in the old game all you have to do is hover over a card and it will show you a larger version off to the side. In the new game, you have to scroll the mouse wheel. Like I said, minor nitpick. Also, the new one is too flashy and dramatic. The old game plays just like the tabletop version. It’s a thing of beauty. It’s just too bad I can’t recreate my Going Rogue deck in it. Beware tiny faerie death. And now I must get ready for work. In my next post, I may talk about the setting I’m tinkering with. Or maybe not. Time for one of my random posts, Frankensteined together from smaller posts to make a monster! Why in the hell did I start writing again? Which of you little jerks said that? Was it you, Genuine Idea to Make the Story Better? Or was it you, Getting Tired of Working on the Second Draft and Trying to Cut It Short? Sometimes it’s fun to read a show. My wife and I continue the search for a new k-drama to watch. We tried Birth Secret and Dating Agency Cyrano on DramaFever, and both are okay, but we both agree that we can find better. Thought we might see what Netflix has to offer. I love DramaFever’s large selection, but the site has been very unstable for us lately, and every time we reload to get it to work, we have to watch at least five ads before we get back to the show. Then it messes up again and the process repeats. I hate ads (unlike the majority of people who love them, right?). Maybe we’ll come back another time and hope it works better. It’s too bad, too, because I just got an email from them recommending a show called Faith that has some time travel, and it sounds cool. A bit historical, a bit modern. It is not on Netflix. Sad face. Go buy this and they’ll give me money! No, not really. But you should still buy it. It’s been awhile since I recommended anything to you fine folk. Let’s see…I know, I’ll recommend a card game. 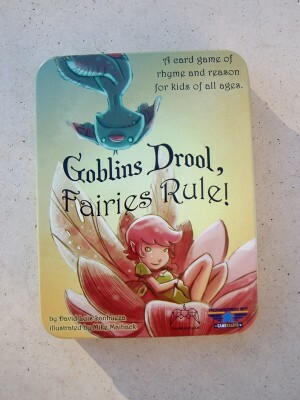 It’s a little gem I helped Kickstart called Goblins Drool, Fairies Rule. The name of the game LIES! It’s aimed for a younger audience, but damn it, I say adults can enjoy it, too. Each card has one side that’s a fairy and one that’s a goblin, and each side has a name and a symbol (sun, moon, mushroom, and frog). You play cards from your hand, and if the name rhymes with any of the cards in the “fairy ring,” those cards flip to their opposite side. Then, any cards with the same symbol as the card you played get added to your hand. The goal is to either get six fairies or get rid of all your goblins (unless you play the variant rules, which is six goblins or no fairies). My wife and I have played it twice since it arrived in the mail, and she’s beaten me twice. I’ll get her one day! It’s a simple game, and I wish there were more cards, but it’s charming and I love the artwork. My favorite cards are Pixie Power for the fairies and Earwax Stew for the goblins. Release an expansion, I say! Anyway, I say you should buy it now, especially if you have little gamers in the house. If you want to see it in action first, here’s a video. And with that, I am off to think about how my story’s timeline ends. The end is here. Rejoice! This is the last post of my first-draft-completion extravaganza. Edits begin tomorrow. Finally. Time to whip it into shape so I can get it published and begin anew my climb to the middle. No, scratch that. The top. Or at least the top of the middle? Almost as good as the bottom of the top. I’d better stop, this is getting topsy turvy. Wherever I end up, I’m wearing a crown and cape and referring to myself in the plural first person. Because I’m going to work hard for it. Since this is the last post, and I don’t have anything better prepared, I’m just going to write about whatever. Nothing you can do about it. Checking the stats for my blog, I saw that someone found me by searching for “awkward back rubbing at work by customers.” Thankfully, I have not experienced that, but I do apologize for not having the answer the searcher needed. If you’re reading this and need advice on what to do, I’d suggest a display of nonlethal force. You could use a mannequin for this if you work in a clothing store. I’m sure you could improvise with something else otherwise. I want to do something fun with Twitter. Two ideas came to mind: 1) Do a “choose your own adventure” story, letting followers vote for the outcome; and 2) making a bunch of fictional accounts and using them to tell stories together. Something fun, maybe with 40% wackiness or so. I’ll have to ponder it some more to decide if it’s a worthwhile idea. Something to invest time in. Spending some time lately playing Reus. It’s a fun little game. Might write a more detailed post about it soon, but for now, just know that you play as a planet and control some elemental giants. If that’s not enough to get your interest, then damn, you’re difficult. Wait until the actual recommendation post, then. Geez. You know, I think this post is enough. I’ve been up since 2 AM, and I’d rather not word anymore. I’ll be back with more posts soon, but don’t expect anything tomorrow. As I said, IT’S EDITIN’ TIME! First, it was Vampire: The Masquerade – Bloodlines. I actually played through it twice (well, one and a half times). It’s probably the buggiest game I’ve ever played, yet the story and characters, as well as the gameplay when it does work, are compelling enough to hold my interest. Surprisingly, I have not yet played as a Nosferatu. I love those ugly bastards. I have discovered a deeper love of the Malkavian, though. Then, Mass Effect. Great story. Tons of side quests. Fun aliens to play with. I assumed the “good little soldier” role this time around. Next time, I’ll be the rebel. That got me nostalgic for space exploration, so I got a new copy of Spore. I know it wasn’t the most awesome game in the world, as I hoped it would be so many years ago, but it’s still fun for a few days of grinding. I made flying monkeys and giant ant-bees. I have played my fill of those games by now. Unfortunately, I am now considering buying Overlord and its expansion pack. Why must Steam make buying cheap games so damn easy? I mean, you can get awesome games for less than five bucks sometimes! It is not helping me be a diligent writer, reader, blogger, etc. It’s not all bad. I started doing my word of the day again. Bed in a couple hours. I have an early day tomorrow. We’ll call this goodnight. P.S. Enjoy the random links.